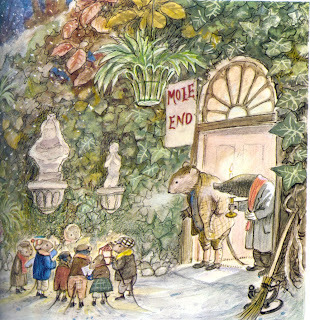 "I think it must be the field-mice," replied the Mole, with a touch of pride in his manner. "They go round carol-singing regularly at this time of the year. They're quite an institution in these parts. And they never pass me over--they come to Mole End last of all; and I used to give them hot drinks, and supper too sometimes, when I could afford it. It will be like old times to hear them again." "Let's have a look at them!" cried the Rat, jumping up and running to the door. As the door opened, one of the elder ones that carried the lantern was just saying, "Now then, one, two, three!" and forthwith their shrill little voices uprose on the air, singing one of the old-time carols that their forefathers composed in fields that were fallow and held by frost, or when snow-bound in chimney corners, and handed down to be sung in the miry street to lamp-lit windows at Yule-time. Through Project Gutenberg, you can read the whole book online! The rest of the "Carol" is found in chapter 5, "Dolce Domum." Joy to all, including the littlest of creatures. The Poetry Friday Round-Up is being generously hosted this holiday by Kate, a.k.a. Book Aunt. Happy Holidays to you and the field mice! Love their carol!! What a lovely post. Thanks for sharing this excerpt. The carol reminds me of one of our interfaith traditions, leaving the door open for Elijah on Passover. Yes, the carol is delightful. I can imagine the little voices singing earnestly in hopes of a warm invitation to come inside. It's comforting to know of the various traditions such as leaving the door open, or setting an extra place--always being ready to welcome!